When Innovations in Civic Participation hosted the 9th Global Conference of the International Association of National Youth Service (IANYS) at the Bibliotheca Alexandrina in Alexandria, Egypt last October, no one could have anticipated the extent of the popular upheaval that has swept through Egypt since January 25. 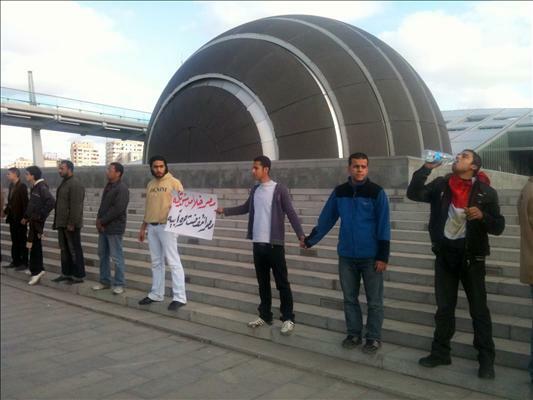 Yet, discussions of Egypt’s youth at the time were in many ways prescient. According to the Egypt’s 2010 Human Development Report on Egyptian youth, which was presented at the conference by lead author Dr. Heba Handoussa, close to a quarter of Egypt’s total population is between the ages of 18 and 29, and over 50 percent are under 30. Yet, unemployment is extremely high among young people, even college graduates. An estimated 90 percent of unemployed people are under 30 and many more are affected by perpetual underemployment (EHDR). Governments throughout the MENA region face tremendous challenges in channeling the potential of their youth population as they make the transition to adulthood. Creating an enabling environment for youth civic engagement by supporting a “robust and vibrant civil society” is a key strategy for confronting these challenges (IANYS 9th Global Conference Report, forthcoming). During the Global Conference, participants emphasized the need for government policies that allow freedom of association and expression, which are fundamental to civic participation, as well as communications outlets that can raise awareness among youth about opportunities available to them. Unfortunately, while the energy and vitality of Egyptian youth and civil society have been on the rise for years, the Mubarak government has attempted to restrict such participation, and recent events have propelled this underlying pressure to the surface. In taking to the streets, young Egyptians are demanding changes in their government and demonstrating their desire to participate fully in society. Their leveraging of social media (some sources have even called it a Facebook-fueled movement) has broadened participation in the protests and drawn international attention to their cause. Youth who were the focus of discussion and participants at the Global Conference have played a leading role in these historic protests. They have also become the fierce protectors of valuable public buildings, including the Bibliotheca Alexandrina that hosted the conference, organizing groups and calling on the army to join them in guarding against vandals and looters. Their actions seem to highlight the transformative power of civic engagement—one that can counter repression and pressure governments to enact reforms that address grievances and allow for the plurality of ideas and public debate vital for peace and democracy. “This is about the people of Egypt who are fed up,” Barbara Ibrahim, the founding director of the John D. Gerhart Center for Philanthropy and Civic Engagement at the American University in Cairo, told the Washington Examiner on January 31. She is hopeful that the “people are winning” and that the transition of power will be lawful and orderly. The driving force of youth in these current events and the participation of individuals from all ages and backgrounds have shown the possibility for inter-generational partnership, another important feature of an enabling environment discussed at the Global Conference in October. However, as protests give way to what Egyptians hope will be a genuine democratic transition, political leaders must take care not to discount the significant achievements that youth have made in the streets by excluding them from this process. As Egypt faces its future, national dialogue must readily encourage the participation and leadership of youth. Some observers suggest that the creation of an Egyptian Youth Party is necessary for ensuring a legitimate voice for young people in the political process. For the sake of Egypt’s youth, our hope is that whatever new government emerges in the aftermath, it will take the formidable force of its young citizens seriously and make a concerted effort to enable and harness their full capabilities. As the title of Egypt’s 2010 Human Development Report suggests, youth are crucial to building Egypt’s future. The courage, hope and dignity of Egypt’s youth witnessed by the world over the past two weeks have made their commitment to that future even clearer. IANYS will be releasing its Report on the 9th Global Conference, which highlights several important themes and issues related to the situation in Egypt, within the next few weeks. In building an ongoing community of practice, IANYS also aims to foster shared learning among its members and will provide opportunities for international and regional dialogue and coordination via an interactive online networking platform, building on the impressive momentum of the conference. Cross posted from the Innovations in Civic Participation blog. Originally posted February 9th.